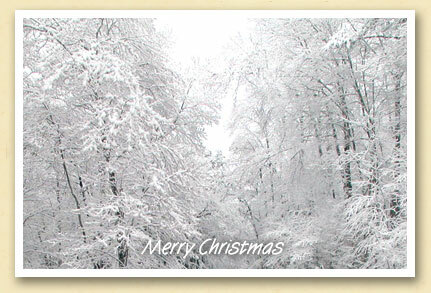 Best wishes for a safe and happy holiday season from the Swain County Chamber of Commerce. Autumn 2008 in the Great Smoky Mountains has seen one of the most colorful Fall leaf seasons in recent memory. 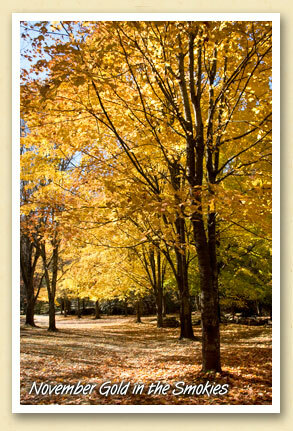 Even now in early November, with much of the Fall foliage laying on the ground, the golds still glow brightly in the afternoon sun. 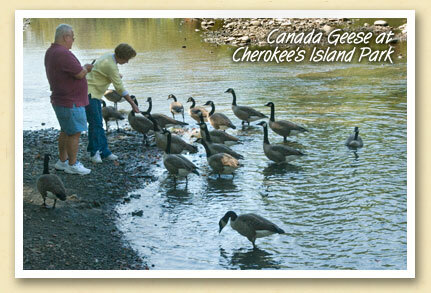 At Cherokee’s Island Park, the shoals of the Oconaluftee River are as popular with the wild ducks and geese as they are with visitors to the Great Smoky Mountains. Above, South Carolina visitors Sherri and Mitchell McCutcheon enjoy the geese on an early Fall afternoon.